Cover photo: Entry of German troops in Paris on 22nd June 1940. German ﬂag on the Arc de Triomphe at the center of Charles de Gaulle Square, formally named Place de l'Étoile. « [...] I felt the drama of Barcelona and Guernica intensely, and I knew that after Munich the Republican defeat would soon come, and that after this Spanish Republican defeat would come, in turn, the entrance of Germans in Prague and Italians in Tirana. Two sentences were forever engraved in my spirit. One of them was said by a Spanish Republican officer on the Portús border, in full withdrawal, in response to a French officer who had treated him withpride and contempt: "I wish you will endure as much as us." During the French disarray of May-June 1940, this phrase never left my mind. As a result of this same disarray, in a burning town, a Spaniard from one of the battalions of pickand shovel told me with simplicity: "Now it is your turn" ». Between September 1938 and June 1940, Europe imploded in a new continental war stirred by fascisms and Nazism and facilitated by the mistakes and fears of Western democracies. While Spain had just lived through the criminal war that the grand counterrevolutionary coalition, led by General Francisco Franco, had imposed in July 1936 against the constitutional power, represented by the Second Republic, in Europe, Italian Fascism and Nazism carried out, step bystep, their expansionist and aggressive plans. Meanwhile France and Great Britain went from the appeasement of these fascisms and the "Before Hitler than Stalin", to the urgency of trying to close an alliance with the Soviet Union to put anend to German and Italian aggressions. It was all useless. Fascism, in its Spanish version, made of Catholic integrism, radical nationalism and Falangism, won thewar in March 1939. A double process of brutal repression and mass exile began immediately; Catalonia suffered singular consequences. Prague and Tirana fell in the spring of 1939 to the hands of European fascists. The Soviet Union opted forits survival. The United States watched from afar. Nothing or anybody could, or wanted to, stop the new European war. On September 3 the conﬂict was already official. On June 20, 1940, the Third French Republic disappeared from the continental map. 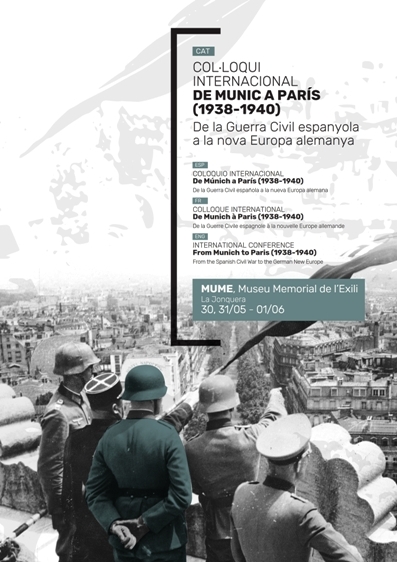 Eighty years after the beginning of the conﬂict, we invite you to revisit, reread and remember this European History. For more information, download the program of the colloque.